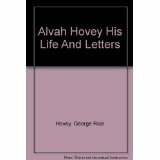 Alvah Hovey (1820-1903) was the long-time professor then President of Newton Theological Institution in Newton, Massachusetts from 1849 to 1899. Hovey was from a Puritan family of farmers whose father was an influential and deeply religious man. Alvah took an early interest in Biblical, historical, and theological matters at an early age. He mastered several languages, reading the Bible more often in Hebrew or Greek than English, and became fluent in German after spending a sabbatical in Europe and taking a profound interest in the language of the German schools. In America Hovey became a leader in the American Baptist movement, the Newton school being originally founded by the American Baptist Churches, USA in 1825. Hovey is best known for being the editor of the American Commentary on the New Testament which appeared in 1885, Hovey writing the volume on John and John Broadus writing the volume on Matthew. Hovey also wrote a theology called Outlines in Christian Theology which first appeared in 1861.